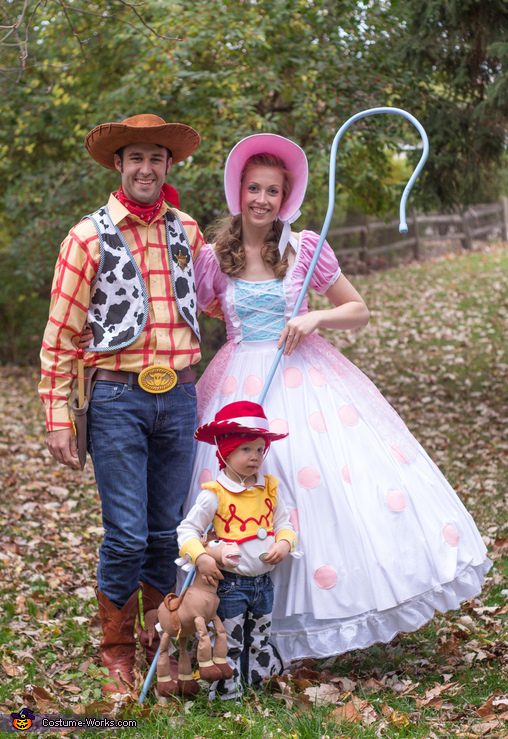 Halloween 2015: Woody, Bo Peep, and Jessie because who doesn't love Toy Story and huge dresses? Roughly 80% is made from scratch and/or modified. Woody has a functioning pull string and a match in the holster. Snake in his boot? You betcha! His accessories were built up using craft foam and the vest was made using a shirt as a pattern, bound with black stripe bias tape. Jessie has braided yarn hair attached to a hand knit cap and her outfit was built off of thrift store finds (A white collared onesie with red trim? Awesome!). The yellow portion of her top was made from an oversized tshirt cut-down and added flutter sleeves - detailed and trimmed with red bias tape (those loops were a bit of a pain). Extra material and some stiff interfacing (along with handy dandy snaps) were used to make the cuffs and cow print chaps were made with black backing, then sewn right to the pants. And what's a cowgirl without her hat? Thanks to a thrift store find, that ran a whole $2.00. Feel free to comment for any more information on how we built up the costumes! Are u planing on selling your po beep costume?